Some office supplies are a no-brainer; you need a printer to print things, you need phones to make calls, and you need computers to do basically everything else. But what equipment do you have to protect your workforce? An automated external defibrillator (AED) — and employees who know how to use it — can save lives when sudden cardiac arrest strikes. Sudden cardiac arrest can happen anywhere, any time. In the United States, there are an estimated 1.5 million heart attacks and strokes each year. One in three American deaths is the result of heart disease. Unfortunately, these incidents almost never happen in or near a hospital, which contributes to the high mortality rate. OSHA estimates that about 10,000 cases of cardiac arrest happen in the workplace each year. As an employer, you may be held accountable for putting your employees at risk if their co-workers aren’t properly trained in emergency preparedness and response. When employees have to wait for medical responders to arrive, the survival rate of cardiac arrest is just 5-7%. But what if your employees didn’t have to wait for help to arrive? Employees and employers don’t have to be helpless in emergency situations. Training for, and access to, an AED can literally save lives. 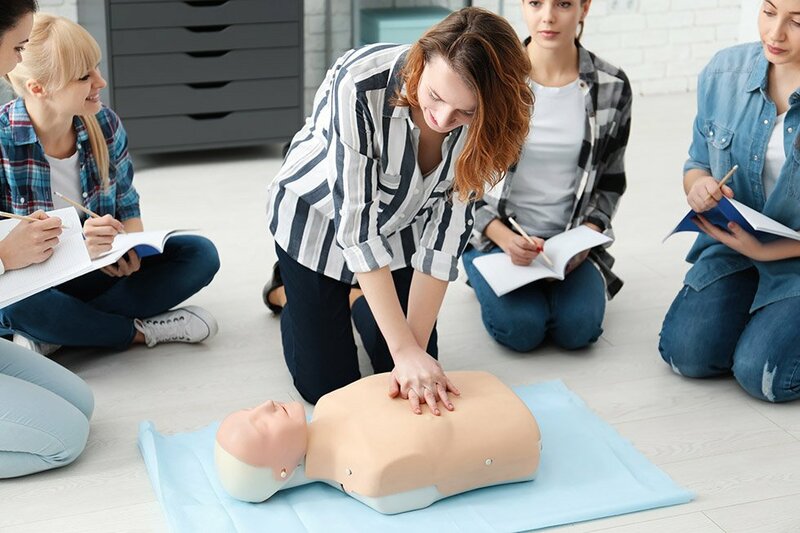 According to one study, communities where individuals were trained in both CPR and the use of AEDs had twice as many victims survive an instance of cardiac arrest compared to communities with members trained in CPR only. The addition of AED training makes a significant difference in your employees’ ability to save lives in the workplace. Workplace AEDs are designed to be easy enough for non-medical personnel to learn and use, and EMC’s workplace CPR and AED training is extremely easy and convenient. Each of our AED units includes an original manufacturer warranty, as well as fresh batteries and pads, ensuring that your AED is always ready when you need it. Train your employees to help each other in emergency situations, and then give them the tools to do so. New York City workplace AED training can save lives. Ready for workplace training or an AED in your workplace? For more information give us a call at 1-212-537-9477 or use our online contact form. EMC CPR & Safety Training, LLC is an authorized provider of American Heart Association CPR, AED, and First Aid training classes. Since its inception, EMC has continued to expand its services to locations nationwide. EMC is also a national distributor of AEDs from leading brands and offers a variety of AED medical oversight/program management options.